Superbly illustrated with 3D drawings and period photographs, this book presents the fighter, bomber and the most famous aircrafts of the First World War. During the four years of the Great War, all the tactics and techniques of aerial warfare were invented and are still valid today. THIS BOOK IS IN FRENCH. 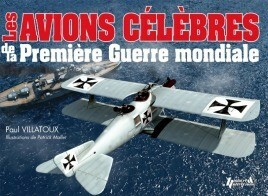 Unfortunately, due to sales rights restrictions, we cannot offer Les Avions Celebres de la Premiere Guerre Mondiale for sale in your country. • Superbly illustrated with 3D drawings and period photographs, this book presents the fighter, bomber and the most famous aircrafts of the First World War. Superbly illustrated with 3D drawings and period photographs, this book presents the fighter, bomber and the most famous aircrafts of the First World War. During the four years of the Great War, all the tactics and techniques of aerial warfare were invented and are still valid today.